On a crisp November afternoon I found myself between the light and the darkness. There is an official name for the celestial version of that condition: “dusk.” I needed to be there as I installed outdoor Christmas lights. In that place between light and dark, I would be able to see what I was doing, as well as being able to see the lights themselves. Shaking my head seemed more appropriate than shaking my fist. And I quickly remembered having the same feeling after my first grandchild, Emaline, was born – that feeling when I understood there are some life experiences for which words fall short of showing the way for another to know the truth. In the almost six months of having to go through all those hard “first-time-without-Daddy” annually occurring events, this had been the hardest yet. After his death on June 5th, Father’s Day came around exactly two weeks later, and soon on the heels of that sad reckoning was what would have been his 91st Birthday on July 23rd. Maybe I was still so numb from his death that I was somewhat protected from the deep sorrow in those first “first-time” experiences. When my birthday rolled around in early November, I was quite sad that I didn’t get my annual birthday lunch at Nashville’s German restaurant, The Gerst Haus. My dad always took me and his dear lifelong friend, Lucien Swint, for lunch (our birthdays were close together). Afterwards we would explore their boyhood stomping grounds, by driving slowly through East Nashville, with the two of them narrating a play-by-play of who lived in every house, and the memories that resided on what seemed like every street corner and old building. It was an annual tradition rich with meaning for me. I thought about some other “firsts.” I thought about what my dad might have felt like the first time he got to hold me after I was born. I thought of the first time he went to one of my school plays, and the first time he heard me sing and play my guitar in public. I thought of the first time he got to see me hold my own child for the first time. I thought of the first time he got to see me lead worship as an ordained Lutheran pastor. The sun kept going down and the coming of dark could not be avoided. But maybe because I had spent that day in the reality of Advent hope, my spirit was no longer tracking step-for-step with the declining sun. 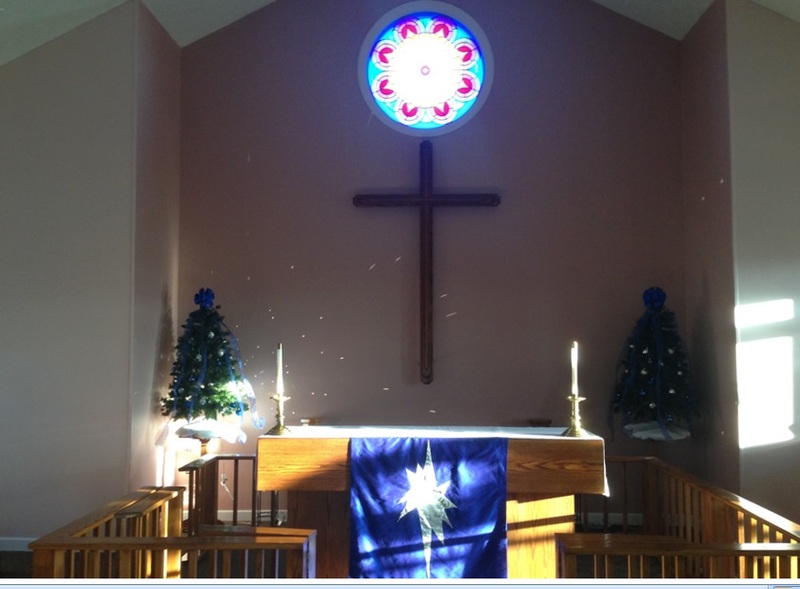 Advent is a four Sunday season of the church that begins the liturgical year. Some people think about it as a “countdown to Christmas,” but in reality, it is a season to reflect on the expectant waiting and preparation Christians are called to do until the return of Jesus Christ at the end of the age. In churches that observe the liturgy, one will see altars and pulpits draped with blue fabric, and the clergy vestments will include blue stoles. There will be a wreath of four blue candles, and in some churches perhaps one might see banners and other decorations bearing the blue of Advent. It is a “blue” season, and as it turns out, it seems that description could be taken literally and figuratively. Advent occurs over the very days that the daylight hours grow to their shortest and darkest. There is scientific evidence that a lack of sunlight can impact and magnify feelings of depression. Like my own experience, this is the time of year when many people experience the exact opposite emotion of all that is being advertised, talked about, and promoted in the malls and TV commercials: joy, happiness, celebration. It is a time when, for some people, it is very easy to find one’s self in a “blue” mood. The color “blue” is used for Advent because it is known as a color that represents “hope.” Perhaps there is no better reason to hope, in this season of Advent, than to reflect on the promise of Christ’s return and what that will mean for all who find themselves in darkness this time of year. “See, the home of God is among mortals. He will dwell with them as their God; they will be his peoples, and God himself will be with them; he will wipe every tear from their eyes. Death will be no more; mourning and crying and pain will be no more, for the first things have passed away” (Rev. 21:3b-4 NRSV). I saw no temple in the city, for its temple is the Lord God the Almighty and the Lamb. And the city has no need of sun or moon to shine on it, for the glory of God is its light, and its lamp is the Lamb. The nations will walk by its light, and the kings of the earth will bring their glory into it. Its gates will never be shut by day—and there will be no night there (Rev. 21:22-25). No tears, no darkness. That’s enough for me to hope for on a crisp November afternoon. Thanks for sharing your dusk soul. Matt- that’s a great thought about how “tending to darkness” can be a verb as well as an adjective. Thanks for tending to the darkness in your world and calling others to be attentive to the darkness… and the light!